I found the above picture in Morris Dees and James Corcoran’s book, Gathering Storm: America’s Militia Threat (New York: HarperCollins 1996). 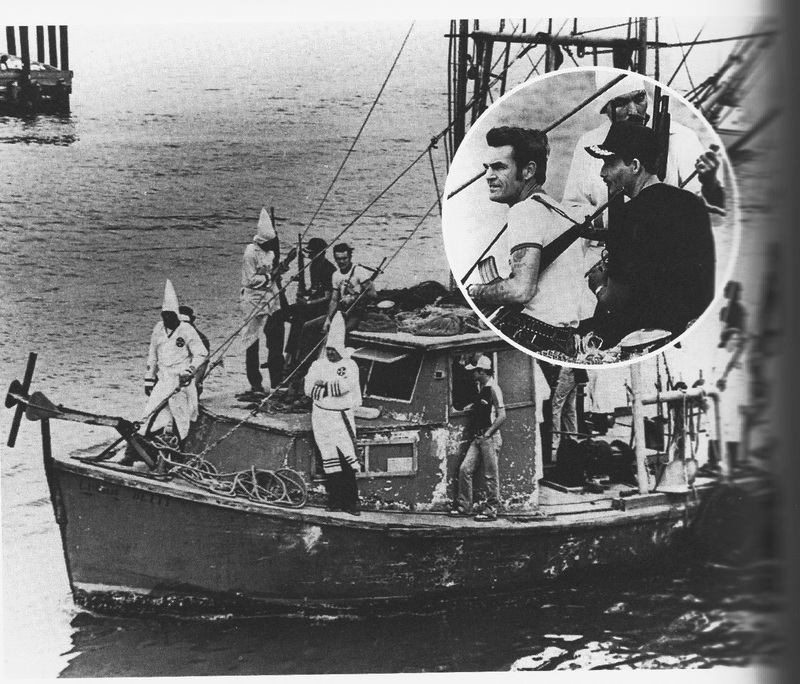 it shows an anti-immigrant vessel crewed by members of the Texas Emergency Reserve, a 2,500 man paramilitary army set up and headed by Louis Beam, The boat terrorised Vietnamese fishermen by running ‘gunboat’ near the docks and their fishing fleets. Dees is a member of the Southern Poverty Law Centre, an anti-racist groups which prosecutes Fascists and right-wing extremists. The book states that the SPLC brought a lawsuit against them, which forced Beam to disband his army of racist fanatics. As you can see, a couple of these Nazis are wearing Klan costumes. I’m putting this up, because there have been demands for similar boats to deal with the migrant ships crossing the Mediterranean. Lauren Southern, a Canadian Alt-Right propagandist, was involved with a project by a group of European Fascists to set up an anti-migrant patrol boat, until it was scuppered by a campaign by Hope Not Hate. But other Fascists groups are making the same demands, like CasaPound, an insignificant Italian Fascist party, a video on which I put up about a week ago. And Katie Hopkins, the rightwing bigot and loudmouth, whose career on this side of the Pond spectacularly imploded a few weeks ago when she became too toxic for even the Scum and the Mail to employ, was responsible for a particularly odious tweet in which she recommended gunning down migrants and their boats without remorse. She then dared the TV presenter, Philip Schofield, to challenge her on these monstrous sentiments. This came a day or two before the bodies of the migrants aboard one such ship, which had sank, washed ashore, including the infant son of a man, who had stayed behind in Turkey. Although this photo is from another time and place, it shows you exactly the kind of Fascist patrol boat the Fascists are demanding today. And it isn’t pretty. There were calls last week for David Davis to reveal the 60 or so impact assessments on Brexit, that the government had compiled and was supposed to be suppressing. Davis himself was facing accusations of contempt of parliament for refusing to release them. Now he has revealed that, actually, there aren’t any. Mike over at Vox Political has put up a short piece from Martin Odoni over the Critique Archives, who makes the obvious point: the government is seriously negligent, and should go. The members of every opposition party in parliament should unite and demand their resignation. He makes the point that the referendum was conducted so that Cameron could get the Tory right on board, and that in the 2 1/2 years since it is absolutely disgraceful that the Tories simply haven’t bothered to work out how Brexit would affect Britain. I can’t agree more. Every day brings fresh news of how Brexit is damaging Britain’s economy and world status. Today there was a piece on the news reporting that universities are finding it difficult to recruit foreign graduates, thanks to Brexit. We have lost three regulatory bodies to Europe in the past week. Mike has also reported that Britain’s scientists will also losing funding due Brexit, as they will no longer be quite so much a part of the European science infrastructure. At the same time the Tory right is trying to strip the human rights and workers’ rights legislation out of British law, to make it even easier to fire and exploit British workers. And British businesses are wondering how well they will fare without access to the single market. Brexit is a mess. And you could tell it was going to be a mess, from the way the Maybot mechanically intoned ‘Brexit means Brexit’ whenever anyone asked her what Brexit meant, all the while staring at the interlocutor as if they, not she, were the stupid one. The Tories have no plan, only slogans and lies. In this case, we’ve seen Michael Gove pop up again and again to give his spiel about how wonderful everything will be after Brexit. As has Young Master Jacob Rees-Mogg. Gove was on the One Show Last Night in an article about the crisis hitting the British fishing industry. And guess what – he said that Britain would once again have the largest, or one of the largest fishing fleets in the world, after Brexit. As Christine Keeler said all those years ago, well, he would say that, wouldn’t he? Many people voted for Brexit because they were genuinely sick and tired of the neoliberal policies forced upon Britain and the other European countries by the EU. This was quite apart from the nationalist and racist fears stoked by UKIP about foreign, and specifically Muslim, immigration. In fact, Brexit has been promoted by the financial sector and its Tory cheerleaders so that Britain can become another offshore tax haven. It’s part of a very long-standing Tory policy going right back to Maggie Thatcher, that has seen the financial sector given priority over manufacturing. The attitude became official policy under Blair, when it was announced that we shouldn’t try to restore our manufacturing industries, and should concentrate on the financial sector and servicing the American economy. It’s a profoundly mistaken attitude. Ha-Joon Chang in his books on capitalism states very clearly that manufacturing is still vitally important for the British economy. If it occupies less of the economy, it’s because it hasn’t grown as much as the financial sector. But it’s still the basis of our economy. But I doubt that will cut much ice with Tory grandees like Jacob Rees-Mogg, who makes his money through investments, rather than actually running a business that actually makes something. And so the British economy is being wrecked, British businesses are looking at ruin, and British workers looking at precarity and unemployment, because the government in this issue is guided by tax-dodging bankers. The Tories have been colossally negligent to the point of treating the British public with absolute contempt. Mike and Mr Odoni are absolutely right.